Noble Jewelry Displays: Welcome to the Noble Jewelry Display Blog! Welcome to the Noble Jewelry Display Blog! If you want to impress the clients that are visiting your shop, you need to place your products in quality jewelry display cases. Noble Packaging is offering a variety of jewelry display cases that will add style and elegance to your store. You can check out the different jewelry display cases that we are offering in our online catalogue. Don't settle for less: it's possible to find affordable and high-quality jewelry display cases at Noble Packaging. Don't forget that the presentation of your products is the key to your success as a jeweler. The best way to achieve that is by placing your products in nice jewelry display cases which will enhance the beauty of your rings, necklaces, bracelets, earrings and watches. 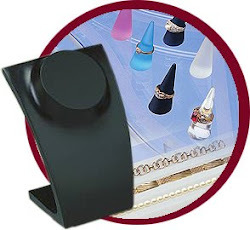 If you are a jewelry merchant and you're looking for elegant jewelry displays for your shop, you're at the right place! Noble Packaging is offering the best and the most impressive array of jewelry displays on the market with its near than 40 jewelry display collections. Whether you need mirrors for your shop, wooden, acrylic, leather, crystal, suede or gold trim jewelry displays, we have what you're looking for. Take a few minutes to check out our jewelry displays catalogue online: it will certainly give you ideas on how you could make your shop look better than ever. Noble Packaging is the leader in jewelry displays and has been satisfying jewelry merchants and consumers all over the world for over 35 years. Nice jewelry display boxes .is there online shopping is available? i want to buy it. I seen this blog few weeks ago and decided about purchasing display cases for my models. I just want to share, they arrived in perfect condition and packaged very well. 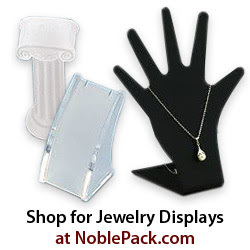 At Noble Packaging, we flaunt the most exquisite jewelry displays. Our selection includes ring, necklace & bangle stands, pendant & chain trays, and platforms and pedestals. Available in a variety of leather, suede, gold trimmed, wooden, crystal, plus more, these jewelry packaging and displays can be imprinted with your personal logo.